Home » Last workshops for 2015! 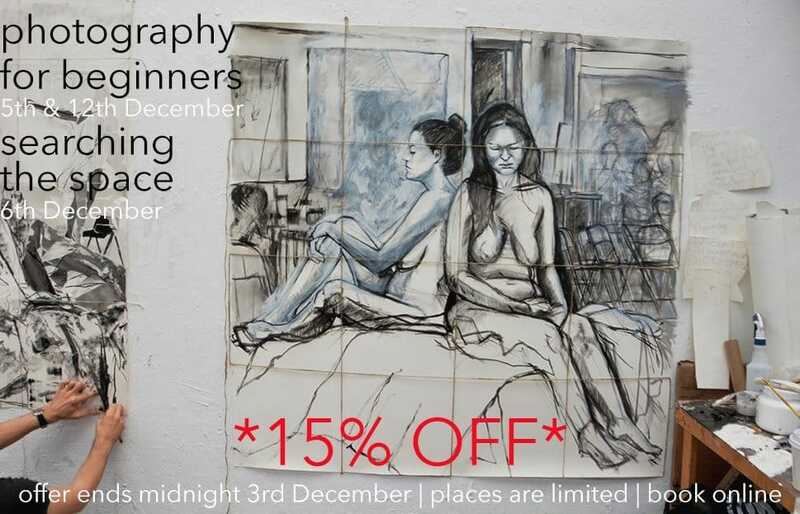 To celebrate the last two workshops for 2015 we’re offering you 15% OFF when you book before midnight December 3rd! SEARCHING THE SPACE is a life drawing intensive working with multiple models tutored by Erika Gofton. It’s on this Sunday 6th December, 10am – 5pm, places are limited. PHOTOGRAPHY FOR BEGINNERS is a 2 week workshop to teach you what the camera functions are, how to use them to your advantage, and how to create the photographs you want with the camera gear you have. It’s on 5th and 12th December, 1 – 5pm, places are limited. Book your place now using the code OPEN to receive your discount! next post: Drop-in Life Drawing is on tomorrow!